I’m sure by now you’ve evacuated if you live in one of the affected areas. If not, get off the Internet and get going! Also, I hope that you’ve stocked up on supplies like food, water, batteries, flashlights, and a crank radio. Hurricane Irene will force our power to go out – it’s pretty much a done deal. But what about those last minute preparations that you might have forgotten. I just had to write one more post about Hurricane Irene because I LITERALLY have not stopped watching The Weather Channel since yesterday morning. My husband has been SO GOOD TO ME – taking care of everything. He knows I am a control freak… and storms like this make me feel VERY OUT OF CONTROL which brings on a heightened sense of hysteria / anxiety. It’s irrational – and I know it. Trying to work through it. Where’s my apple wine? Computers – make sure they are on a surge protector. Also make sure you’ve backed up what you need to back up and keep that external next to your bag should you have to up and leave. It won’t be worth searching for if things get rough, but if you put it near your bag now, it won’t be hard to take it with you on your way out. Don’t have an external hard drive? Use sites like shutterfly.com to upload pics and Google Docs to store anything else of importance. ICE – WHEN (not IF) the power goes out, you will have a better chance keeping your perishables safe if you make ice bags NOW. 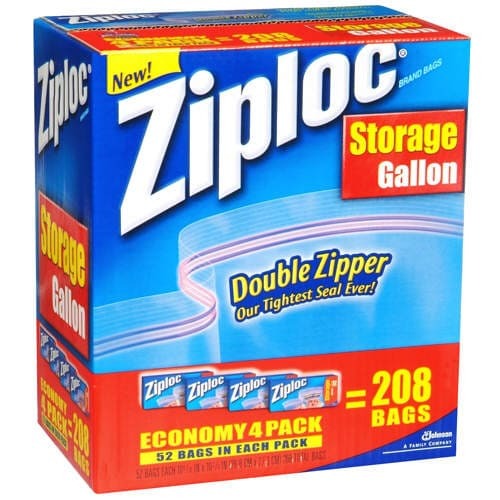 Fill large ziploc bags with water and freeze them. FILL YOUR FREEZER with as many as you can. When the power goes – at least you will have all that extra cold to keep your goods safe. You can also throw a few of them in your fridge to save that food. Also consider packing a cooler with ice. You can store your meat, veggies etc. in there for at least an extra day. WATER – First of all, you should bath everyone on the day the storm is supposed to hit your house. Then fill one of your tubs with water to use should the plumbing stop working. You can dump the water from the tub in your toilet to force everything down and out of your bathroom. At this point, we’ve done everything we can. Bill has been in and out of the house ALL DAY. I think secretly he is enjoying himself. It’s all very primal isn’t it? Taking care of the family. Protecting loved ones. Getting ready for battle – and all that jazz.